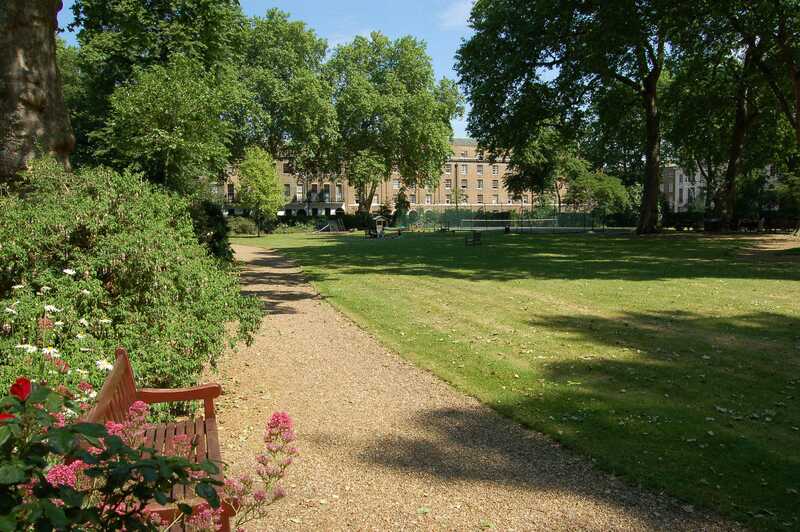 The Garden was laid out and planted between 1809 and 1810 as the centrepiece of the newly developed Mecklenburgh Square to the east of the Foundling Hospital (now Coram Fields playground). The Hospital Governors, who had been forced to lease a large part of the estate to address its parlous finances, nevertheless insisted that buildings only be erected on three sides of the Square in an attempt to preserve a pleasing prospect for the increasingly urbanised Foundlings. By 1814 houses were completed on the south and east sides of the Square and the newly appointed Garden Committee felt it was high time for some stringent rules ‘to be fairly painted on a Board and fixed at the Southern entrance’. Residents’ female servants were only allowed into the Garden under strict supervision whilst neither male domestics nor dogs were ‘to be admitted under any pretence whatsoever’. Despite the Committees’ best efforts, however, garden-users were often exposed to insult from ill-mannered invaders from Gray’s Inn Lane and so employed a burly beadle (whose hat cost two pounds and fifteen shillings) to patrol the east side of the Square. The Garden’s first planting plan, compiled by Mr Smith of Bedford Nursery, was a cornucopia of arboricultural extravagance. Six quince stood alongside 8 yellow jasmine, 26 sweet brier, 14 almonds, 6 tall beech, 7 laburnums and 22 proud oak. Although most of these trees have been succeeded by their 21stcentury heirs, some of the 64 original London Plane are still with us. The paths also remain as they were 200 years ago. The gardens are owned by Goodenough College and are not usually open to the public, Visit our website http://mecklenburghsquaregarden.org.uk/ or come during Open Garden Squares Weekend, always the second weekend of June, on the Sunday afternoon. When visiting, why not stroll awhile in the company of some of our Garden’s historical illuminati. Follow chemist Samuel Parkes down the west path as he dabbles in horticultural necromancy. He died at No. 30 in 1825, but not before winning the Scottish Horticultural Society’s Silver Cup for his revolutionary use of salt in vegetable growing. As you herd your family under the Plane for a portrait, be wary of the critical gaze of Richard Beard who pioneered the quick exposure daguerreotype in 1841 whilst living at No. 31 and then went on to open Britain’s first photographic studio, on Regent’s Street. Perhaps you will agree with journalist and bon viveur George Augustus Sala (who lived at No. 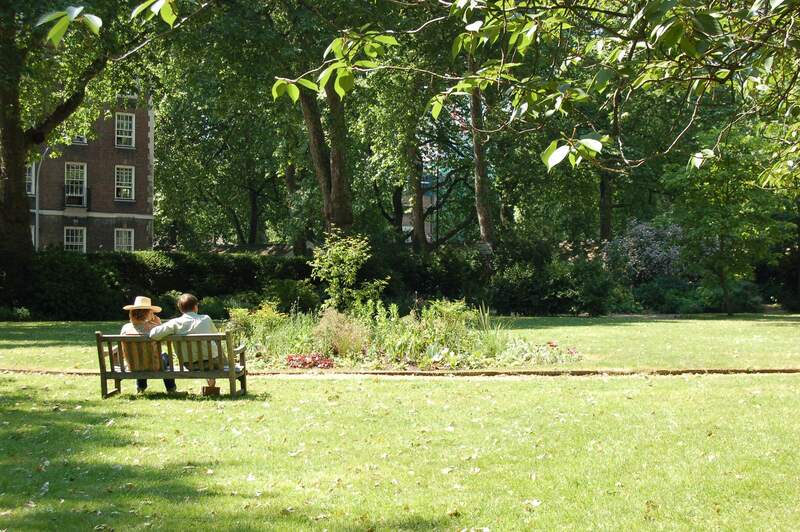 46 from 1877), that the Garden is ‘one of the oldest and greenest full-bottom wigged Squares’ in the whole of London. His careless talk cost him dearly, however, and he was arrested in Paris in 1880 for spying. Or if you feel moved to imaginative exaltation by the Mecklenburgh muse, you join esteemed company: D H Lawrence lodged on the top floor of No. 44 in 1917, John Masefield became poet laureate in 1930 whilst living at No. 18 and was likely inspired by the Garden’s most loyal residents to write Reynard the Fox, and Leonard and Virginia Woolf ran the Hogarth Press out of the basement of No. 37 before Luftwaffe bombs brought the whole house down in 1940. But don’t be overwhelmed by the nostalgic weight of 200 years of history. Chemists and photographers, poets and spies have all succumbed to the cyclical seasons leaving us, here and now, to enjoy the rising sap of Spring exuberance, the seaside squeals of crowded Summer, the honest toil of Autumn and the surprising solitude of Winter amidst ten million suddenly silent souls.